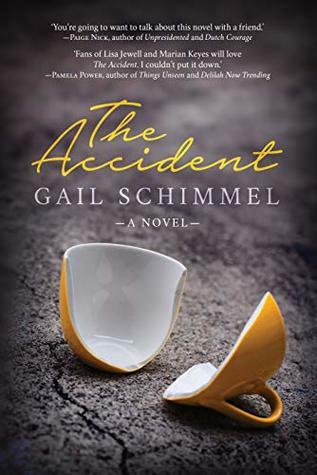 Gail Schimmel’s novel, The Accident, is told through the voices of four characters, each dealing in their own way with the same contemporary events, though two of them also have to contend with what happened in the past. Catherine’s way of coping is to exist rather than live – growing up, her daughter Julia thought she was a zombie. But back when Julia was an infant, Catherine was in the accident of the title which left her husband in a more than 20 year-long coma, and all she wants to do is see Julia happy and settled so that she can finally opt out and stop even going through the motions. Julia, however, has a knack for making wrong choices. Her main wrong choice in the novel is to fall for her new best friend Claire’s husband Daniel. This, of course, is pretty rough on Claire, a high-achieving working mother, and it also worries Catherine, who sees the situation as possibly compromising Julia’s future and her own long-term plans. But it does mean that Catherine has to engage a little more fully with the world around her – a good thing. Of course, this being the kind of ultimately feel-good fiction that it is, there are plenty of good things going on, particularly in the field of making the characters re-evaluate their present lives and come to terms with their pasts, some of the details of which are slowly revealed as we go along. Well, let’s say three-quarters of the characters do the re-evaluation. One, who is rather obviously flagged from the start as being a major pain, does find it all rather more difficult. The four protagonists are a little relentlessly clever and funny, despite all the disasters they meet with. For me, the two most appealing are Catherine and Claire whose problems are at least not entirely of their own making. But altogether The Accident is a well-constructed, lively read with just enough bite to keep the reader engaged throughout.